It seemed like Kennedy was just due for a goal the way he was playing on Saturday. He was flying all over the ice and his speed was giving the Rangers issues, as he kept getting steps on their D and helped create a couple of odd-man rushes as a result. Rangers goalie Henrik Lundqvist with 13:26 left in the third to give Pittsburgh a 2-0 lead. Kennedy also got an assist on Bennett’s first-period goal, giving him his first two-point effort of the season. Jeffrey also got his first two-point effort of the season as he finished with a pair of assists, and Kennedy pointed out his effort this afternoon as a big one. Pens beat the Canadiens in OT: 7-6; Letang gets 4 assists! 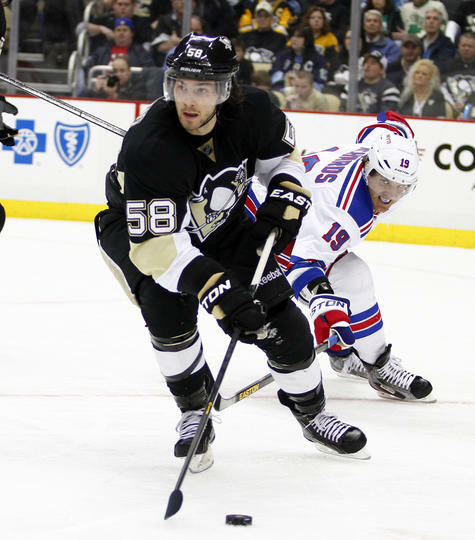 Kris Letang gets 2 points, Penguins beat the Ducks 6-2!